Our telephone is answered from 8 am to 5 pm (CT), Monday to Friday. 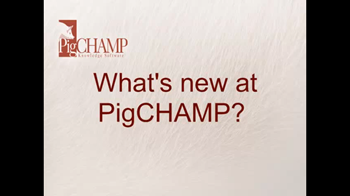 In PigCHAMP, the Trace List features contains all of the background data that is used to compile a PigCHAMP report. To find this information, simply click on the "trace list" tab on a completed report. From there you can view the history and lifetime performance of an individual animal. Trace list data can also be export to Microsoft Excel for further analysis and reporting. 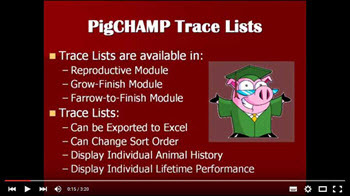 For step-by-step instructions on how to use Trace Lists, view this YouTube video or press F1 from within your PigCHAMP program to access the built-in Help Files. Congratulations to PigCHAMP customer Keith Schoettmer of Schoettmer Prime Pork, who was named the 2015 America's Pig Farmer of the Year. This award, created by the National Pork Board, recognizes a pig farmer who "who excels at raising pigs using the We CareSM ethical principles and connects with today’s consumers about how pork is produced." Keith is a long-time customer of Rensselaer Swine Services, a PigCHAMP agent in Indiana. –Dr. Thomas G. Gillespie, Rensselaer Swine Services.